A recently published Cardionote highlighted the findings of a very recent study published in The Lancet, which showed the efficacy of radiofrequency renal denervation in the treatment of patients with combined systolic and diastolic hypertension, as documented by ambulatory blood pressure monitoring. (1) An article by Kandzari et al. aimed to evaluate the safety and blood pressure response following renal denervation in patients with uncontrolled hypertension on antihypertensive medications was also published recently in The Lancet (2). The SPYRAL HTN-ON MED (ClinicalTrials.gov, number NCT02439775) is an international, randomised, single-blind, sham-control, proof-of-concept trial, involving patients with uncontrolled hypertension recruited in several countries in three continents. This trial enrolled 467 hypertensive patients aged 20–80 years. Entry criteria were: 1. Office systolic blood pressure was between 150 mm Hg and 180 mm Hg and diastolic blood pressure was 90 mm Hg or higher; 2. 24 h ambulatory systolic blood pressure between 140 mm Hg and 170 mm Hg at second screening; and 3. Treatment with one to three antihypertensive drugs with stable doses for at least 6 weeks. Patients underwent renal angiography and were randomly assigned to undergo renal denervation or a sham procedure. The primary efficacy endpoint was blood pressure change from baseline, based on ambulatory blood pressure measurements assessed at 6 months. The primary analysis was done in the intention-to-treat population. An interesting aspect of this study is that medication adherence was systematically assessed. Safety of the procedure was assessed during follow-up (which is still ongoing). The initial report in The Lancet (2) presents results for the first 80 patients randomly assigned to renal denervation (n=38) or sham control (n=42). As reported by the authors (2) the main finding was that “office and 24 h ambulatory blood pressure decreased significantly from baseline to 6 months in the renal denervation group (mean baseline-adjusted treatment differences in 24 h systolic blood pressure −7·0 mm Hg, 95% CI −12·0 to −2·1; p=0·0059, 24 h diastolic blood pressure −4·3 mm Hg, −7·8 to −0·8; p=0.0174, office systolic blood pressure −6·6 mm Hg, −12·4 to −0·9; p=0·0250, and office diastolic blood pressure −4·2 mm Hg, −7·7 to −0·7; p=0·0190)”. The change in blood pressure was significantly greater at 6 months in the renal denervation group than the sham-control group for office systolic blood pressure (difference −6·8 mm Hg, 95% CI −12·5 to −1·1; p=0·0205), 24 h systolic blood pressure (difference −7·4 mm Hg, −12·5 to −2·3; p=0·0051), office diastolic blood pressure (difference −3·5 mm Hg, −7·0 to −0·0; p=0·0478), and 24 h diastolic blood pressure (difference −4·1 mm Hg, −7·8 to −0·4; p=0·0292). Of interest, hourly assessment of 24 h systolic and diastolic blood pressure showed a greater reduction in the renal denervation group. No differences in blood pressure were observed, however, at 3 months of follow up. The study was also confirmatory of reduced medication adherence among hypertensive patients, which was about 60% and varied for individual patients throughout the study. No major adverse events were recorded in either group but the follow up continues. Taken together these results suggest that compared with sham control renal denervation can significantly reduce blood pressure with no safety concerns. Larger studies are now required to confirm and expand these important observations. Renal denervation (RDN) was initially proposed for the treatment of resistant hypertension. The use of a relatively invasive procedure such as radiofrequency ablation of renal nerves to lower blood pressure (BP) was based on sound scientific principles and previous experimental and clinical evidences. However, the SYMPLICITY HTN-3 study, which included a sham procedure and ambulatory BP measurements, showed a small (2 mmHg) difference in BP reduction in the RDN group as compared to the sham control group. Despite these rather disappointing results, the interest in RDN treatment was not abolished and two other studies were conducted in hypertensive patients, addressing whether RDN achieved by intravascular delivery of radiofrequency energy could reduce BP in patients being off medication (Spyral HTN -OFF) (1) or in patients on stable antihypertensive medication (Spyral-HTN ON) (2). involvement of the sympathetic nervous system in hypertension. The SPYRAL HTN-ON MED randomized 467 uncontrolled hypertensive patients, and the results for the first 80 patients, treated in most cases with diuretics, calcium antagonists and ACE inhibitors or angiotensin receptor blockers were reported (3). At baseline uncontrolled office hypertension was confirmed by ABPM and patients were randomly assigned to undergo renal denervation or a sham procedure. As in the Simplicity -3 study, adherence to pharmacological treatment was systematically evaluated and a mean drug adherence of 60 % was reported. Changes in ambulatory BP at 6 months from baseline were the primary efficacy endpoint and a difference between the RDN treated group and the sham control group similar to the Spyral HTN OFF study was observed. Changes in BP were maintained during the day and nighttime. Interestingly no changes in office or 24 hours hear rate was reported. The procedure safety was confirmed. 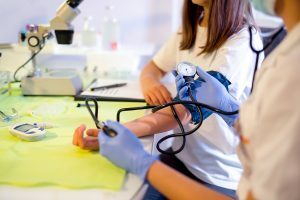 The study also confirmed a decreased drug medication adherence among hypertensive patients which remained constant during the full duration of the study, despite wide variations among individual patients. Taken together these results suggest that compared with sham control renal denervation can significantly reduce BP with no safety concerns. These important observations have been recently confirmed in another study, using endovascular ultrasound RDN in untreated hypertensive patients, and reproducing the results of the Spyral HTN OFF study. These new evidences, in association to the technical evolution of RDN and the strong influence of the device manufacturers, will probably contribute to a wide uptake of RDN all over the world. However, a critical approach should be maintained among clinicians when proposing this new “non–pharmacological” treatment to both untreated and treated uncontrolled patients. In particular, long-term non–adherent patients that could best benefit of a definitive, perhaps, procedure should be clearly screened and identified. More over the possible interaction between antihypertensive drugs and RDN should be assessed, since the difference between RDN and sham procedure was shown to be similar in treated and untreated patients. Finally, the long-term duration of BP reduction induced by RDN and the effect on target organ damage and/or on cardio and cerebrovascular outcomes should be evaluated in a longer follow-up period of patients included in all these studies. Townsend RR, Mahfoud F, Kandzari DE, et al. Catheter-based renal denervation in patients with uncontrolled hypertension in the absence of antihypertensive drugs (SPYRAL HTN-OFF MED): a randomised, sham-controlled, proof-of-concept trial. Lancet 2017; 390: 2160−70. Kandzari DE, Böhm M, Mahfoud F, et al., on behalf of the SPYRAL HTN-ON MED trial investigators. Effects of renal denervation on blood pressure in the presence of antihypertensive drugs: 6-month efficacy and safety results from the SPYRAL HTN-ON MED proof-of-concept randomised trial. Lancet 2018;391:2346-55. Azizi M, Schmieder RE, Mahfoud F, et al. Endovascular ultrasound renal denervation to treat hypertension: The RADIANCE-HTN SOLO randomised trial. Lancet. 2018;391:2335–2345.